Water from your tap is perhaps the best bargain out there for your diet, your health, and your wallet. For the volume of water that a typical person drinks, it’s practically free. It’s free of calories and has almost no health-damaging additives. Your tap is probably the biggest bargain in your house. 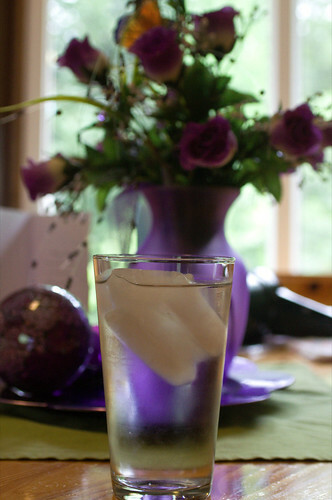 A big glass of water can achieve a lot of things for you for almost no cost. It can encourage weight loss by filling you up before a meal as well as by replacing beverages that would add calories to your diet. It can keep you from being dehydrated, which can improve your energy level and also help with heart health (as dehydration is very hard on the human heart). Dehydration also makes exercise much more difficult. It can cure headaches like nothing else. A glass of water is my first response to any headaches I might have. It can help with digestive problems, which can be caused by drinking too many acidic beverages. Water is neutral, and your body is designed for it. How much water should you drink each day? The Institute of Medicine suggests that an adequate intake for men is roughly three liters (13 cups) of total beverages per day, with women aiming for 2.2 liters (or 9 cups) per day. Notice that’s total fluid intake. Most Americans take in less fluid than that, and much of that intake is in forms other than water. If you want to save money and enjoy some of the benefits of drinking water, I suggest striving for the adequate daily intake of water for your gender while also replacing half of your other beverages with water. So, let’s say you’re a guy who currently drinks eight cups of other beverages a day – coffee, alcoholic beverages, and so forth. Those eight cups are pretty expensive when compared to water; you’re probably paying $0.50 per cup at least, which adds up to $4 per day for beverages. Change things up. Move to drinking nine cups of water per day and four cups of whatever beverage you choose. Doing that moves you up to the daily recommended water intake, provides most of the benefits described above, and also saves you $2 a day in beverage costs. Water is an incredible bargain. Take advantage of it.